It's the Little Things. . .: I LOVE White Ceramic Ware! Earlier today I was talking on the phone with my sister who lives in Michigan. She informed me that she was "very disappointed" that I hadn't blogged in a while! I tried to explain I have been really busy this week but she didn't want to accept my excuse . . . so, here you go, Sis! Here's a picture of a platter I picked up at a local thrift shop called Chaps. I didn't see the signs when I walked in -- everything was 50%! Walked out the door paying only $1.30! It didn't fit in with my big wall display in the living room, so this one hangs in the dining room next to the patio door! Headed over to Goodwill and found these this past Wednesday! The cashier asked me if get "the discount"; when I asked, "What discount? ", she said, "The 'Senior Discount'!" I was honest and told her "no" . . . I'm just 52 but I guess my hair made her ask the question! The platter was $5, the creamer .99 cents, the cup and saucer $2 and the little bird print and frame $2. I was thinking of painting the frame black and putting some scrapbook paper and our last name initial in place of the picture! I'll be sure to post when I finally figure out what I'm going to do with it! Found these at TJ Maxx -- all of the plates were in the Clearance section -- the two blue plates were $2 each, the square embossed plate was $4 and the white serving platter $5. I did pay full price for the black plate rack -- $5. I set the platter on the plate rack and have that in my kitchen. Still trying to decide where I want to hang the other plates. Remember the little gravy tureen I found a couple of weeks ago -- here it is on my kitchen counter. The soup tureen was given to me last year by my daughter when she was visiting from NY. Her grandmother gave it to her but she decided she didn't want it (it wasn't her "style"). I told her I would take it even though I had no idea what I would do with it. Now I'm scouring thrift shops and garage sales for any white ceramic plates and kitchen ware I can find! 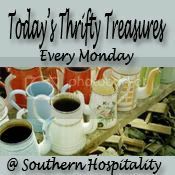 Check out more thrifty treasures on Rhoda's Southern Hospitality blog http://southernhospitality-rhoda.blogspot.com/ . Another white dish collector! You found some great things. I'll take that beautiful platter. Love it. Thanks for coming by.